WELLAND - A penny saved is a penny Jeannette Andrea MacGregor’s kindergarten class knows can help a child live a better life. 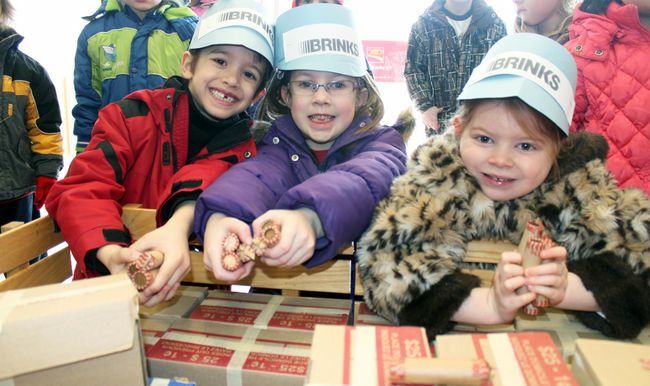 MacGregor’s 21 junior and senior kindergarten students, some dressed as Brinks guards, walked from Fitch Street Public School pushing and pulling a wagon with all their might across the Fitch Street Plaza parking lot on Monday morning to deliver $475 in pennies to CIBC. “With pennies going out of style it seemed like it was time to bring them in,” MacGregor said. For just more than five years, she and her students have collected the coins from parents, students and businesses for Sleeping Children Around the World. The charity gives children in developing countries a bed kit that includes a mat or mattress, pillow, sheet, blanket, mosquito net, clothes and school supplies. Fitch Street Public School’s donation will help purchase 13 bed kits. “It’s important to teach (students) that this money can buy something for someone else because when you’re young like them it sticks,” MacGregor said. She said collecting, counting and rolling the money helps the kindergartners with math skills. She also teaches them about what it’s like to live in different countries. Melissa Kuczera, the assistant branch manager at CIBC, said having children into the bank teaches them it’s a friendly place with real people. “It’s never too early to start learning about money,” she said.